Save more than $3000 on the web design resources you've been always looking for to create your impressive WordPress website. Create effective web design projects in no time. Wait no more! Start building your killer WordPress website today. Buy now for $3240 $19 only. In total, 31 professional items to help you with every project! This web design bundle is one of its kind you can not miss to own. Auril is a clean and modern one page WordPress theme. This theme is ultimate flexible with loads of nice options and features. It can be used as a One Page / Multi Page website. It is Retina Ready and Responsive. Mountain comes with 3 versions: image background, image slider background, and Youtube video background. The scale is a premium Bootstrap web application admin template. It’s beautifully coded and fully featured, ready to be implemented in the admin end of your web application, or as an intranet theme. It’s also perfect for your next Rich Internet Application. Renovation – Construction and Renovation HTML Template is a unique and modern Template that fit for construction, architecture, renovation, remodeling, repairing and all construction and renovation type business. It has a beautiful and unique design that will be best suited for your online web presence. This template has 100% responsive design and tested on all major handheld devices. The Decent Mobile is a premium niche WordPress theme designed especially for mobile phone and News Blog. It features a responsive mobile ready design powered by Bootstrap 3 that looks great on all devices. The coin is a faucet list of Bitcoin, Litecoin, Dogecoin, Blackcoin, Dash, Peercoin, Primecoin and Bitcoin Cash. Display the top faucets by multiple cryptocurrencies. RoyalTimer is a WordPress Plugin that comes with flipping animation. You can adjust the flip background color so that it changes over time, or you can use a static background color. Colors are set to digits, the rear panel, and signatures. It uses vector data to draw the digits and the panels of the countdown. There isn’t a change in the quality of the displayed drawings when it gets resized. Prizm is a responsive minimal, business under construction/landing page / one page WordPress Plugin. This minimal template is packed with a countdown timer, ajax subscription form, social icons and about page where you can write a little bit about yourself and add your phone, email and address information. With this WordPress Plugin, you will be able to work on your site/theme while your visitors see the under construction page. When you’re done just disable it in the Prizm admin and your new site will be live. You can then keep using it whenever you need to take your site into maintenance mode. Charitas is a multicurrency donation plugin for PayPal merchant. This plugin can have many forms, many campaigns and can be set up for a multilingual site. Also, it is integrated with MailChimp so you can add donor to your marketing list. It has Captcha spam bot protection on the Form too. You will get lifetime access to this web design bundle. 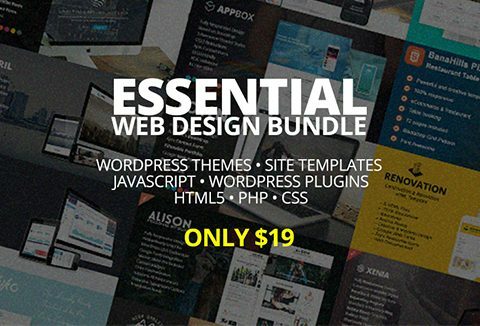 This web design bundle includes a Commercial license. You will get updates and support for the 1 year from the purchase date. Do not miss your chance to SAVE BIG! At A Price Of $19 Only!